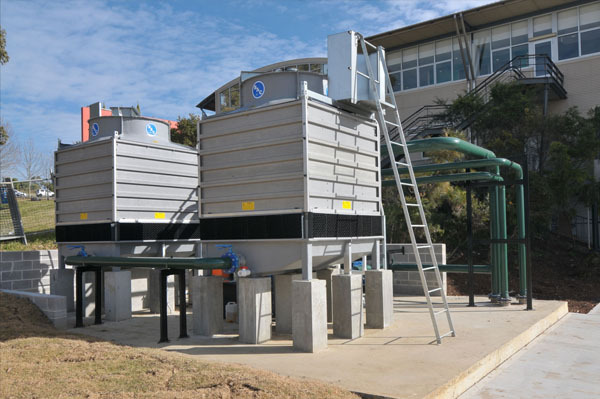 R&D Air Supply Pty Ltd has recently completed the Major refurbishment works to the Air conditioning and Ventilation systems installed at Building BJ, University of Western Sydney Werrington. The existing teaching facility was a mixture of an air cooled Chilled/Heating water systems and air cooled DX plant serving the building. The existing air cooled air conditioning systems have been demolished. The existing chilled and heating water pipe work, fan coil units and controls have been incorporated onto the new central chilled and heating water system and new Building Management System. R&D was responsible for the Design development of this project. The basic concept was prepared by UWS representatives. R&D reviewed the concepts presented and further developed those to ensure the spatial requirements and restrictive areas could be identified and alternatives proposed. Extensive communication between end user and client was developed to ensure the proposed air conditioning installation was fit for purpose while also meeting the client's needs. This extended to ensuring acoustic analysis was done on the proposed areas to ensure the strict noise level requirements were achieved especially to areas like the sound production area that were required to achieve NR 20 noise curve. The central cooling plant comprises two off water cooled magnetic bearing chillers located in the refurbished basement plant room. They are connected to two externally located cooling towers for heat rejection. The chilled water system is of a primary and secondary nature. 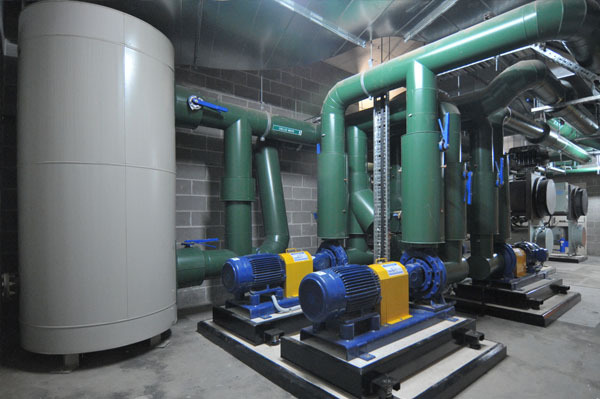 Constant chilled water flow balanced by VSD is maintained to each chiller. Secondary water flow is reticulated to the field through a de-coupler, to AHU's and FCU's where required, again modulating the water flow controlled by VSD run/standby pumps. The Heating plant comprises two off gas fired boilers located within a new fire rated plant room. The heating water system is of a primary and secondary nature. Primary water flow is maintained through each boiler matched. Secondary heating water flow is reticulated to the field AHU's and FCU's where required, modulating the required water flow controlled by VSD run/standby pumps. The building has been provided with four off main air handling units. 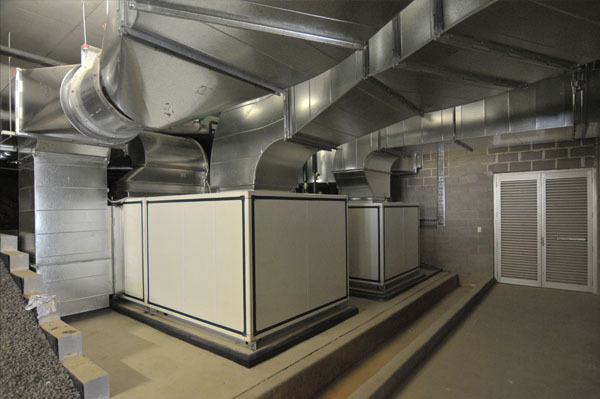 Two main air handling units AHU 01 and AHU 02 are located adjacent the main basement level plant room and supply tempered outside to numerous fan coil units serving individual teaching spaces throughout the building. AHU 03 is a variable volume air handling unit supplying conditioned air to the Level 2 production studio with the associated VAV terminals modulating air to the individual spaces. 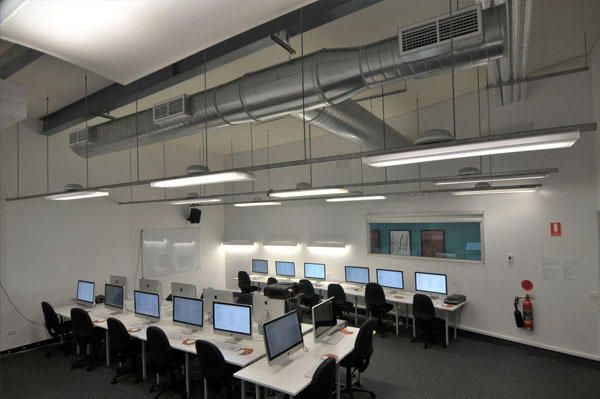 The Level 1 lecture theatre is served by AHU 04, which provides heating, cooling and economy modes to the lecture theatre through a displacement type air distribution system. Due to the high population loads experienced in this space, heat recovery has been incorporated to either pre cool or pre heat the lecture theatre outside air delivered to this space thus reducing the energy consumption. During periods of low occupancy CO2 monitoring has been incorporated to reduce the amount of outside air required to the space and therefore the energy consumed. There are numerous Chilled and heating water fan coil units air conditioning individual teaching spaces through the building. Chilled and heating water are reticulated directly to them. The atrium area is provided with an assisted ventilation system to relive used outside air from the building. The potential heating or cooling capacity of this vented air is harvested and transferred to AHU 2 and 3, by a dedicated heat shift, re-circulating water system transferring heat/cool to the AHU mounted coils. The installation of the new chilled /heating water air conditioning system and mixed mode system serving the atrium, has resulted in an energy efficient installation compared to the original plant. The project was challenging. Considerable coordination and close working relationships were established and maintained with University of Western Sydney, and the school occupying building BJ. Extensive programming and staging of work was required to enable the refurbishment works to take place and changeover from the existing system in a seamless nature. Building BJ refurbishment works were completed June 2012.